MANILA, Philippines – The Alliance of Concerned Teachers (ACT) slammed the 'profiling’ being made by the Philippine National Police (PNP) to their members. According to ACT, police have been doing the rounds in several public schools and gathering names of teachers who are members. The teachers’ group pinpointed the profiling to Duterte administration's attempt to shut them down. ACT said that the gathering of their members’ names is part of “grand fascist scheme to suppress all forms of opposition." Joselyn Martinez, ACT's national chairperson, confirmed that several policemen went to their school in Malabon and asked the principal for the names of ACT members. 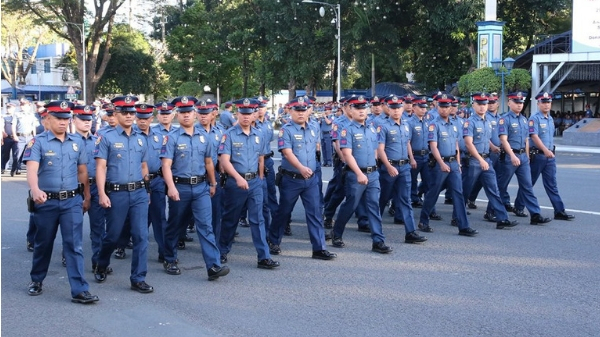 Martinez added that the police officers had a memorandum order with them supposedly signed by Chief Inspector Rexson Layug of the Manila Police District Intelligence. The incident also happened in several schools in Cebu, Isabela and Mindanao. Martinez lamented, “Ang mga teacher, gumagawa kami ng aming tungkulin pero bakit kami gagantuhin ng Duterte government?" "Ano ang susunod na gagawin ng mga kapulisan matapos makuha ang mga pangalan? Papatayin nila kami? Anong gagawin nila, ipapakulong nila kami?" she asked. ACT stressed their right to self-organization, freedom of expression and assembly, right to privacy, as well as the Magna Carta for Public School Teachers. Their statement said, “PNP, back off! Hands off our teachers! Hands off our schools! Stop profiling ACT members! Junk all memoranda on profiling of ACT members!" With 180,000 members, ACT is the accredited and sole regional union of teachers in the National Capital Region, as well as Regions 5, 6, 7 and 11. 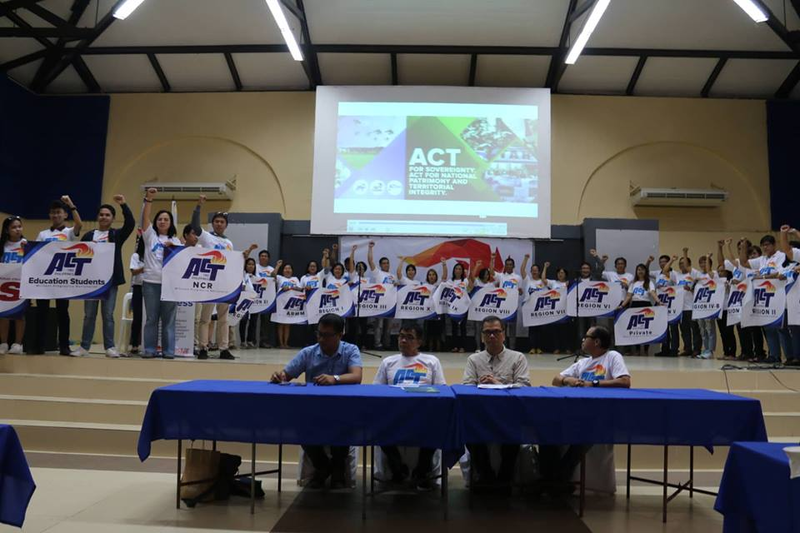 ACT is linked to ACT-Teachers party list with Representatives France Castro and Antonio Tinio. Representative Castro urged school administrators to help protect their teachers. 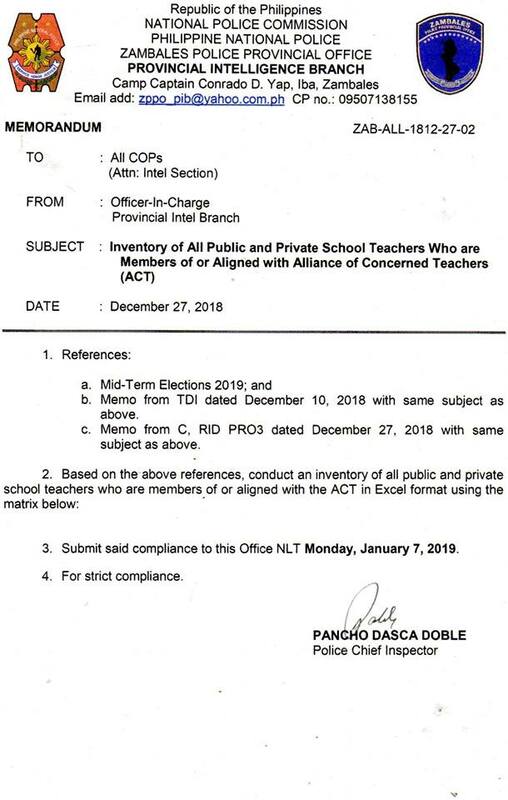 She also gave a warning that administration or criminal raps could be filed against administrators who forward to names of teachers to PNP officials. The Department of Education issued its statement regarding the profiling made to ACT members. In a statement, DepEd asserts that they have not received any instructions from PNP regarding the submission of a list of ACT members. If such a request would be asked, DepEd said first evaluate if it violates certain laws and regulations.